New York's Attorney General has issued subpoenas to a fast food company and is investigating several franchisees for what employees say is a rampant issue. An update, with comment from the New York Attorney General’s office, appears below. At an 11 am press conference outside a Brooklyn KFC restaurant, fast food workers and activists will release a new report alleging rampant wage theft in their industry, one of the fastest-growing in the United States. The report includes results from an Anzalone Liszt Grove research survey of 500 of the city’s fast food workers, in which 84 percent reported that their employer had committed some form of wage theft over the previous year. Reached by e-mail, a spokesperson for the National Restaurant Association told The Nation, “We fully support compliance with all state and federal wage and employment laws.” The attorney general’s office did not immediately respond to a request for comment. “Wage theft” is a term popularized by activists and advocates over the past decade to describe a wide range of ways in which companies fail to pay employees the wages they’re legally owed. The Fast Food Forward report identifies several types of violations as prevalent in the city’s fast food industry: employees working, without pay, before or after their shift; employees working overtime without being paid time-and-a-half; employees working during their breaks or not receiving breaks; and delivery employees not being reimbursed for expenses like gasoline or safety equipment. The report quotes McDonald’s worker Elizabeth Rene, who says she loses up to $75 a month because she isn’t paid for the time she spends counting the register before and after her shift: “I feel cheated and used and like I’m not appreciated for my hard work.”A 2008 study by the National Employment Law Project estimated that the average low-wage worker loses 15 percent of his or her annual income to wage theft. As I’ve reported, recent years have seen a rise in labor activism around wage theft, often backed by unions or “alt-labor” groups organizing non-union workers in the workplace and in local politics. In 2010, New York passed a statewide anti–wage theft law that the Progressive States Network described as the strongest in the country. In January, the Chicago City Council unanimously passed an ordinance that threatens offending companies with the loss of their business licenses. In other cases, forcing unwanted legal, political or media scrutiny on alleged wage theft by a company has proven a potent weapon in labor groups’ “comprehensive campaigns” to force concessions from management. The release of today’s report could represent an additional front in campaigns by Fast Food Forward, and parallel groups elsewhere, to transform jobs that are increasingly representative of work in the modern United States. Update (12:15 pm Thursday): The New York Attorney General’s office has confirmed to The Nation that it issued subpoenas to a fast food parent corporation, and is investigating several New York State franchisees (the AG’s office declined to name the corporation). Schneiderman’s office is exploring potential legal violations including sub-minimum wage pay, unpaid work, false payroll records, overtime without time-and-a-half pay, work expenses that weren’t fully reimbursed and paychecks that bounced. In an e-mailed statement, Schneiderman spokesperson Damien LaVera called the Fast Food Forward report’s findings “deeply troubling,” and said they “shed light on potentially broad labor violations by the fast food industry.” “We take the allegations seriously,” said LaVera, “which is why our office is investigating fast food franchisees. 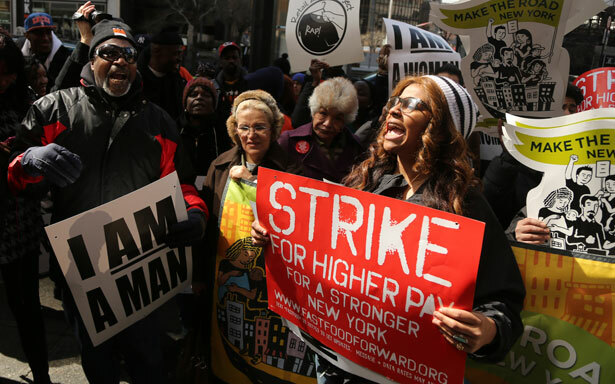 New Yorkers expect companies doing business in our state to follow laws set up to protect working families.” LaVera urged workers who have experienced wage theft by fast food companies to contact the attorney general’s office. Across the country, domestic workers are left unprotected from labor law. Read what you can do to help.